Not far, mind you – in the July approval numbers Louisiana Gov. John Bel Edwards was at 49 percent approval, which was a drop from the 56 percent figure he posted back in January. 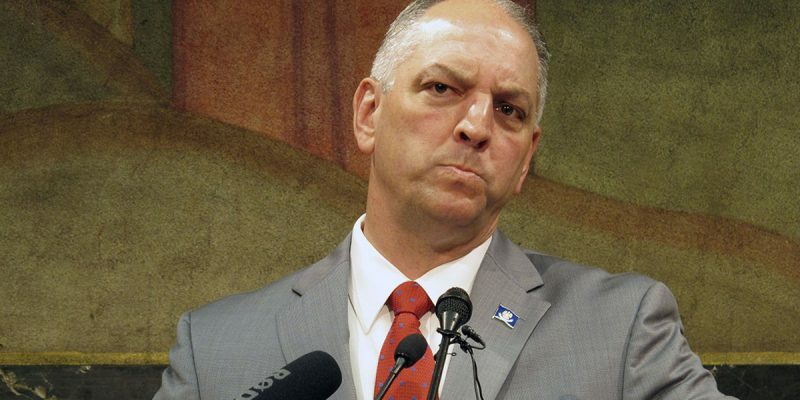 And now, Edwards is down to 47 percent, making him the 30th most popular governor out of 50. Some 34 percent of Morning Consult’s respondents disapprove; the rest don’t know or don’t care. Certainly things could be worse for Edwards. For example, Kentucky’s Matt Bevin is sitting at a dreadful 30 percent, with 55 percent disapproval. Oklahoma’s Mary Fallin is at just 17 percent approval, while Connecticut’s Dan Malloy is at 20, and Illinois’ Bruce Rauner and Alaska’s Bill Walker is at 25. They’re all politically dead at this point, while Edwards still has some prospect of re-election. That prospect does seem to be declining, though. Last month the Hayride/Remington Research survey found Edwards’ approval rating to be 49 percent – but he was only at 43 percent on the question of his re-election. Seeing that Edwards is quite likely to catch a very well-known and well-funded Republican opponent – more than likely that’s going to be Sen. John Kennedy, who checks in at a 49-24 approval rating in Morning Consult’s companion poll on senatorial approval (comparatively Kennedy’s doing pretty well; only 21 senators are at 50 or above) – a 43 percent re-elect number spells defeat. Who’s the most popular governor in the country? That would be Republican Charlie Baker in Massachusetts, who checks in at 70 percent approval. Following behind him is another blue-state Republican, Larry Hogan of Maryland, at 67 percent, with Republican Kay Ivey of Alabama at 65 percent, Republican Chris Sununu of New Hampshire at 60 percent and Dennis Daugaard (R) of South Dakota at 59 percent rounding out the top five. All 10 of the highest-rated governors are Republicans; the most popular Democrat governor in the country is Montana’s Steve Bullock, who’s in 12th place with a 54 percent approval. And on the most depressing note of all, Vermont’s voters made their two senators, the decrepit and embarrassing socialists Bernie Sanders and Pat Leahy, the two most popular senators in the country. Sanders checked in at 63 percent and Leahy at 61.